When is pasture safer for the insulin resistant (IR) horse – late afternoon or early morning? Google this question, ask your vet, or talk to a friend and you will get both answers! How frustrating! It’s time we cleared this up. Grass is a living organism and requires NSC (non-structural carbohydrates) for energy in order to grow. NSC is a measure of sugars, starch, and fructans and is produced through the process of photosynthesis when the plant is exposed to sunlight. Grasses accumulate NSC as the day progresses, making them highly concentrated in NSC by the late afternoon. Once the sun sets, grasses will metabolize NSC for energy, making them lowest in concentration in the early morning hours. This pattern can be disrupted if the night temperatures remain below 40 degrees F (4 degrees C). When exposed to cold, grasses will hold on to NSC and not relinquish it during the night, making morning grazing less safe for the IR horse. Warm and cool season grasses behave differently during prolonged intense heat and sunlight[i]. Warm-season grasses (e.g., Coastal Bermuda and Teff) will naturally thrive during very hot, sunny days and accumulate substantial amounts of NSC by day’s end. However, cool-season grasses (e.g., timothy, brome, orchard, crested wheat grass, rye, fescue, as well as alfalfa) will actually be lower in NSC during periods of prolonged heat and sunlight, as long as the grass is adequately watered. This apparent contradiction occurs because heat and light stimulate the cool season plant’s enzymes that burn off NSC. Here again, there is a difference between warm and cool season grasses. Photosynthesis still takes place during cloudy days. However, clouds usually cool down the temperature. This can potentially decrease NSC in warm weather grasses, but cool season grasses respond to cooler, more moderate temperatures with a higher NSC content. You have to know your grasses. You can’t be passive about it. The best way to think about the NSC content in your pasture is to first know the type grass you have, which will give you an idea of what climates it prefers. Then, examine the amount of stress the grass is enduring. Stress will cause all grasses to be higher in NSC. Starch: long chains of glucose molecules. Add ESC + Starch. You want this sum to be less than 11% (on a dry matter basis) to be considered safe for the IR horse. This is because ESC and starch digestion will raise blood glucose and cause a rise in insulin secretion from the pancreas. Elevated blood insulin is the basis for many laminitis cases. Fructans and starches vary according to the type of grasses. Cool season grasses and alfalfa tend to be higher in fructans, while warm season grasses accumulate starch. The sugar content of all grasses, however, can vary dramatically mainly based on environmental factors. 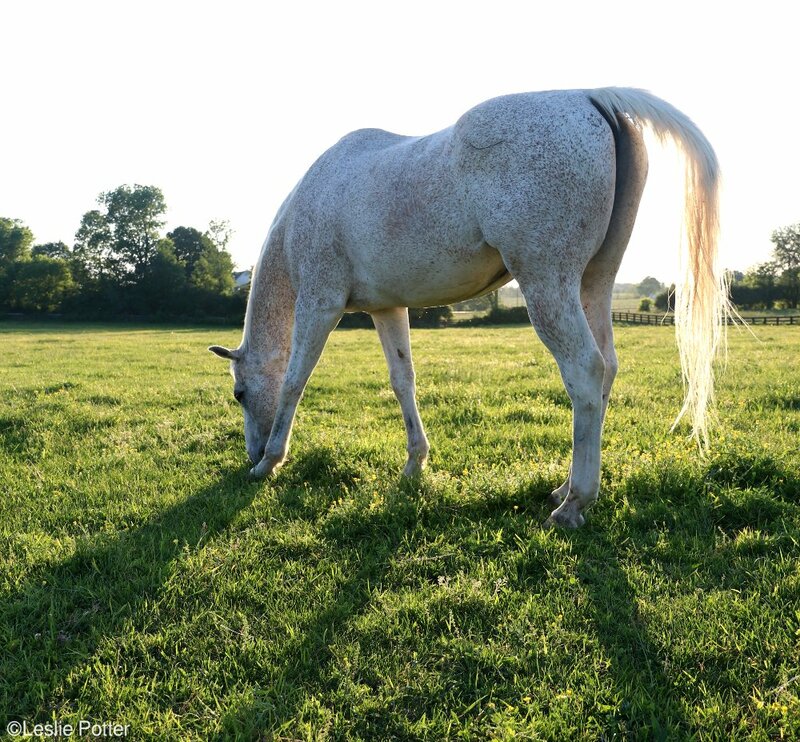 Pasture grazing is the best way to keep your horse healthy. Grasses are not only highly nutritious, but grazing supports both physical and mental health. Get to know your grasses and periodically have them analyzed to offer your horses grazing opportunities at the most opportune times and conditions. [iii] Johnson, R.J., Rivard, C., Lanaspa, M.A., Otabachian-Smith, S., et. al., 2013. Fructokinase, fructans, intestinal permeability, and metabolic syndrome: An equine connection? Journal of Equine Veterinary Science, 33(2), 120-126. [iv] Crawford, C., Sepulveda, M.F., Elliott, J., Harris, P.A., and Bailey, S.R., 2017. Dietary fructan carbohydrate increases amine production in the equine large intestine: Implications for pasture-associated laminitis. Journal of Animal Science, 85, 2949-2958.